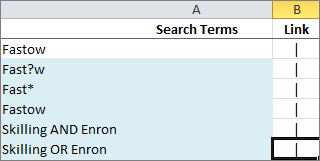 This page will help you create and save searches of specific terms by using an Excel spreadsheet created from a supplied template (link at bottom of page). You copy into the spreadsheet multiple search terms, one per row. The spreadsheet automatically generates links that allow you to generate search results in Lexbe eDiscovery Platform. The spreadsheet template is particularly helpful when you have large numbers of search terms to review in a case (up to 1,000 search terms are supported in the template). By enabling searches to be produced from a spreadsheet link, much time can be saved in a large review. This is particularly helpful when responsiveness and privilege reviews are to be done primarily on the basis of searches, rather than linear document review. Within Lexbe eDiscovery Platform, the document sets returning from search results can be mass tagged to Responsive and/or privilege with multi-doc edit. Finally, when the documents are opened in the document viewer from the search results, you will be able to see search terms highlighted in out 'Hits' and 'Text' tabs. >Use single keywords or you can use the following Boolean modifiers such as AND or OR (e.g., 'Skilling OR Enron'). Also Wildcards * (for everything remaining in word) and ? (for one character) can be used (e.g., 'Fast?w' or 'Fast*'). Search terms that are very long may not work properly and certain unusual characters may not work. (both browser dependent). Please note that we do not support this spreadsheet as part of Lexbe eDiscovery Platform, its functionality will vary depending on your version of Excel and your Browser, and it is intended for a 'Power' Excel user. Prepare your search terms using the Excel spreadsheet templates and upload it to the case for shared (read-only) access and convenience. Other users would be able to click on and are taken automatically to the search results page.